Can News.me become the Instagram for news? We’ve written before about the overwhelming tsunami of content that digital media represents, especially the firehose that comes from Twitter and Facebook, and how this makes it even more imperative that users have some kind of filter or curation system. 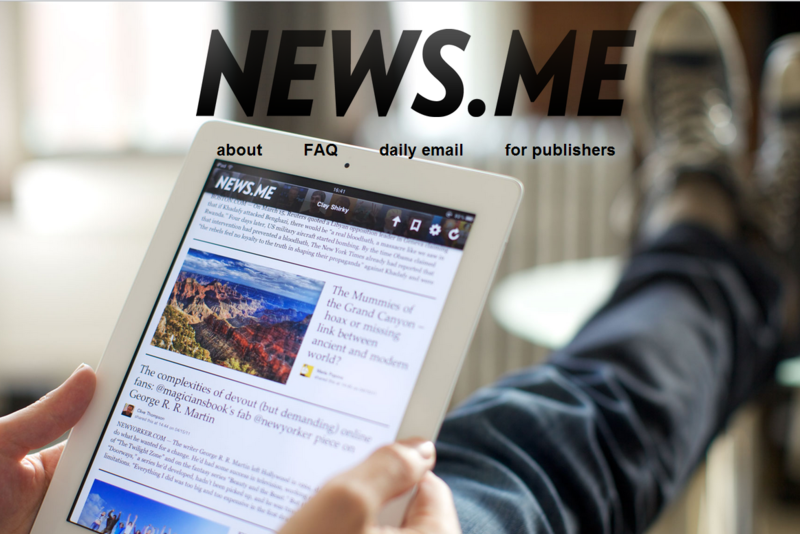 News.me is one of the services that is trying to solve that problem, but it wants to do more than just filter and recommend: the startup’s new iPhone app is designed to be like an Instagram for news — in other words, a smaller network of friends and connections with whom you want to discuss the latest headlines or events. The question for News.me is whether that’s what news consumers want, and even if they do, whether they won’t just use Twitter or Facebook instead. News.me has an interesting history: It started as a skunkworks project inside the New York Times — an attempt on the part of a couple of NYT developers to come up with a way of filtering Twitter based on a user’s social network. The team formed a partnership with the New York-based incubator and venture firm Betaworks (creator of services such as the Bitly link-shortener and Chartbeat) and then News.me was eventually absorbed into Bitly and the New York Times wound up with shares in the company. The startup has been spun off but is still based in the offices of Betaworks in the meat-packing district of New York City, where I spent some time recently with general manager Jake Levine. News.me’s app is a good filter, but is that enough? The iPad app that News.me launched with in April of last year offered a somewhat unusual experience, and one that seemed to appeal to some users (like me) and turn others off. Once you added a number of Twitter sources to the app — which also provided some prominent users as a default — you could click on their avatars and see their Twitter stream as though you were looking over their shoulder; something Hunch co-founder and angel investor Chris Dixon has called “cross-dressing.” This was odd, but also fascinating in a way, but it was also somewhat cumbersome, since you had to click on all those individual avatars to get each person’s view, and it became rather time-consuming. The iPhone app (not surprisingly) provides a much more stripped-down experience. You connect your Twitter account and then News.me uses its algorithms — which Levine said are based in part on the sharing activity of your personal network and partly on the trending topics identified by Bitly — to show you what the most popular and/or most discussed or shared topics are. It’s a little like the Flipboard app for the iPhone (without the flipping), but the focus for News.me is more on the conversation around the posted item, which you can see and add to easily when you read a post. Although I have only been using it for a short time, the app does a pretty good job of surfacing both items that I’ve seen and posts that I haven’t seen but are interesting — and it is handy to see, and be able to retweet, the comments from friends in my network. So like Summify (which was recently bought by Twitter) and other apps like Zite (acquired by CNN), News.me is a pretty good curation tool. But this is clearly the same ground that Twitter itself seems to be aiming at with its “Discover” tab and the Summify acquisition, so why would I decide to use News.me? Levine says that News.me’s goal is to be much more than just a Twitter filter — he wants the app to become a social network of its own, built around news, in the same way that Instagram is a micro-network built around the sharing of photos. But why wouldn’t I just discuss the news with my friends and social graph on Twitter or Facebook or Google+? Levine said those networks have grown to the point where they are more about broadcast than they are about conversation, and so there is a need for a smaller experience in which you can talk about news with your friends and connections. As the News.me CEO explained to the Nieman Lab, part of this realization came about when the company’s email newsletter — a daily summary of what your network is reading, much like what Summify and other services like Percolate offer — started to really take off. The rate at which people opened the email, and the sharing that took place from it, convinced News.me that there was room for a “purpose-built” network based around discussion of the news, and the app is an attempt to deliver that. I’m not convinced yet that I need a special network or app just for discussing and sharing news stories or blog posts, however. I still do that mostly through Twitter and Facebook, and they work pretty well — and while Instagram is an appealing metaphor, I’m not sure that news requires the same kind of content-consumption experience as photos, in the sense that people want to consume them and discuss them in a smaller network. But it is definitely an interesting experiment, and one worth watching. Interesting move from News.me. The idea of building a social network around news is compelling. But learnings with our curation startup Scoopinion have shown that people love to share stories, but not within the curation service. We had discussion on place and users got notifications if a story they read throughoutly got commented, but it really didn’t take off. Discussion was sparked, but it happened either in Facebook, Twitter or news site. Though I remain sceptic, it really is interesting experiment and worth watching. And after Twitter acquired Summify, News.me has to differentiate from being “just” a twitter curator. Getting news just from the people you follow takes away the whole “serendipitous” aspect of news discovery. It is good, but it is only half of what news should be. Should swing by http://frrole.com , kinda complementary, with the focus on getting “signal” not out of people you follow, but the whole big universal data set. You should probably note that Frrole focuses on local news. News.me is for general news. There are some good ideas here, but relevance will be this app’s downfall. It seems to just tell you what content the people you follow are interacting with the most. That is very good for filtering out junk content like spam, but it does a poor job of filtering by my interests. My News.Me feed was very noisy. Not only the quality, but also the quantity of news is lacking. My feed just doesn’t have enough items, especially when compared with my other discovery tools. Zite beats this app on both quality and quantity, as does Trapit. Neither has the social features of News.me, but content is more important to me. Both Zite and Trapit focus more on the interest graph than News.me does. The more you focus on the interest graph, the better discovery is for niche topics like, say, content discovery. Trapit ignores social signals, so it finds content that the social web doesn’t, like content discovery articles. 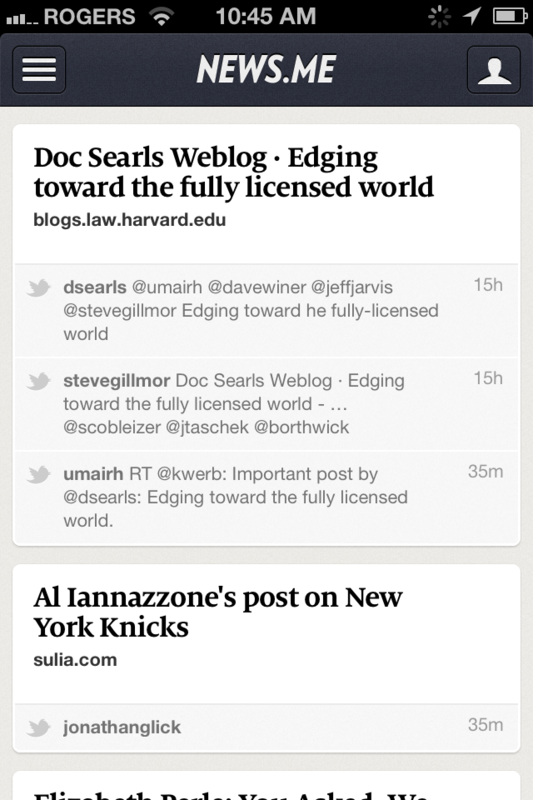 Zite is somewhere between the two extremes, so it is best for following more mainstream topics. Thanks for the comment, Coleman. I agree that the news selection is hampered (or restricted) by the fact that it’s just from people you follow, but it is trying to be a small-scale social network around news so I guess that is the trade off.